Last May, Frank Lueptow of Frank’s Piggly Wiggly finished a major expansion of the stores’ deli in Elkhorn and he gave the WGA’s Brandon Scholz a tour last week after the Friend of the Grocers award to State Rep. Amy Loudenbeck. The project expanded the work place and prep area by 1,400-sf and included an expanded storage in the back. In addition, the deli has a 2nd floor loft that is used veggie prep area and for pre-made or made-to-order meat, cheese, fruit, salad and sandwich trays. 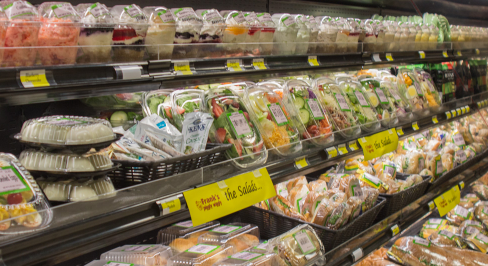 The Deli Department stocks a variety of meats, cheeses, salads, antipasto and specialty items. The 35 employees in the deli make everything from scratch. Included in the 1,000 specialty items include sandwiches, pizza, salads, dips, Heat & Eat items, shredded and chopped veggies, cut up fruit, snack mixes, caramel apples and more. See more here.